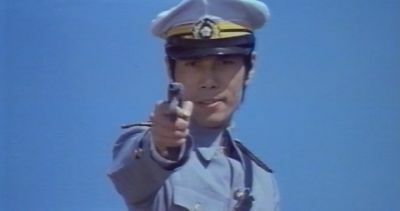 As with Joseph Lai's IFD, Tomas Tang was putting together marketable ninja action made out of a mini shoot of their own and a pre-existing movie from elsewhere in Asia in the 80s. Similar yet oddly different in feel, Filmark fired on a fun cylinder that felt very different, almost lesser in actual quality than Godfrey Ho's direction over at IFD but also more expansive, epic and ambitious. Possibly even more fun therefore, Filmark came into their own when abandoning the marketable concept of ninja with movies like Robo Vampire but Shadow Killers Tiger Force is not boring old times despite. I'm sure Filmark knew they were kind of inept as filmmakers but had the right spirit about it and Shadow Killers Tiger Force makes a case for that being very true. 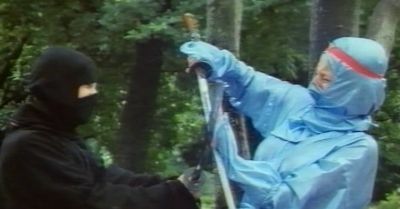 Featuring daylight attacks by the ninjas on unsuspecting groups containing women and a Sun Chien (one of the Venoms and a fairly regular presence at Filmark) fighting cameo, lead Cora Bentley also provides the advantage of performing admirable in the action scenes. Which are choreographed with plenty of detail and sharp speed and later on, plenty of wacky details for the wildest ninja finale yet. If anyone believe Godfrey Ho could ever be responsible for Filmark madness (a common misconception is that Ho directed the Filmark productions as well, something the man has officially denied), you've not paid attention. 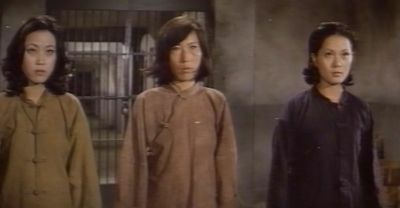 Filmark also do their damndest trying to create the illusion of this being one movie (one dull, one awkwardly acted) by having our lady ninja appear in prison wear, working alongside other women and looking over at events from 1976 and the effect is basically there but the elements delivered to Filmark of their acquired older source are very faded and stand out like a sore thumb against their colorful 1986 shoot. Shin Sang-ok's original also doesn't provide much spark and it's a rather dull looking and standard women in prison movie. Nothing is identifiable, especially not characters and even though Chen Hung-Lieh dones a deliciously evil grin throughout the movie and an escape sequence involving gasoline drenched water and therefore fire is thrilling, it's Filmark's touches that provides the spark. Thankfully deviating from IFD's formula of a very short and calculated end fight between the Western ninjas and their agile Chinese stuntmen, director Tommy Cheng (an actual actor and on-screen fighter) puts Cora Bentley and Wayne Archer in three different locales and true ninjitsu (but probably not) gets displayed in the form of female seduction, decapitation, self-healing and it's capped with Archer being chased around with a ninja blessed, heat seeing rocket on a wire. This sequence shows equal ambition and done for the hell of it on a low budget because if it amuses its creators attitude. Maybe an experimental stance done in the name of market spark Tomas Tang and company were looking for. I hope it was successful but its impact for those looking for Filmark with an enthused eye towards their market product and their relaxed, fun stance towards its creation will get some of the best times with ninjas ever with the name Tomas Tang attached to it. Including in here.